When you are a runner you are faced with a lot of different weather conditions. The summer of 2018 will not soon be forgotten in Europe. Record after record got shattered with the heat and dry conditions and this does not help when you like to run outside. How do you make sure you can still get in some workouts? We know, kind of obvious but important enough to keep mentioning and a lot of people still take this too lightly every year. When it gets hot outside and you go running your body needs the fluid to produce more sweat in order to keep the body cool. Don’t overdo it, you can drink to much water and the body will not appreciate this, but step it up some compared to other seasons. As stated you will sweat more because the body is trying to cool itself to keep the core temperature as stable as possible. You need ventilation in your clothes to help it out a bit, so make sure you wear a shirt and shorts that ‘breath’. 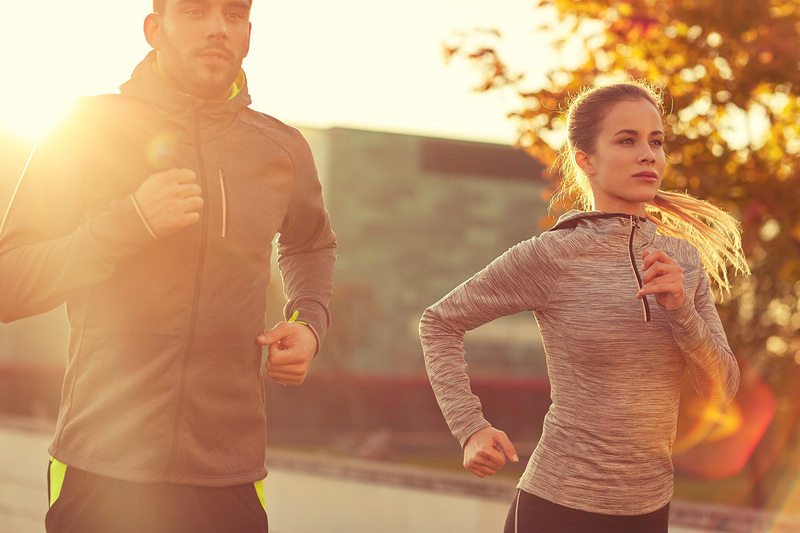 Try to stay away from dark colored clothes because they will absorb more heat when running while the sun shines. A good pair of sunglasses can help you out with the shimmering of the sun. A hat can do the same, but it prevents the head from ventilating. Not only the temperature but also your heart rate will rise up to 15 beats. The body needs that extra heat to be handled to it will increase its efforts to do so. People that have good circulation will have the least increase. Next, to the temperature, the humidity will also play a big part in this as it becomes more and more difficult to regulate as the humidity increases. Adjust the intensity when facing harder conditions! Places with shade will provide better running conditions, so looking for a place where you can be out of the direct sunlight is a very good idea. Parks and forest often have good running paths with hard surfaces. Just make sure you have enough juice in the battery and carry some water with you before heading out. Sometimes we don’t have a choice, but if at all possible prevent from going in the middle of the day when the sun is at it most intensity. If you are an early bird then why not get running before the world really starts? The temperature will be very pleasant, there will be a lot of space to run and you can witness the sunrise. Otherwise get in your run at the end of the day, the same conditions should apply to this except for the sun, you might see it going under on the horizon. When running late make sure you still have enough energy to get the run done the right way. In the morning your body will be buzzing with energy so it makes sense to try and get running before the starts to deplete your energy. Run in the morning or late at night when the sun is less intense. Try to find sheltered conditions for extra cool conditions. Avoid roads that have asphalt ‘cooking’ in the sun. Change to dry clothes directly after running. Decrease consuming coffee, tea, and alcohol. These beverages will produce more urine. Fluids are most easily absorbed by the body at 59 degrees Fahrenheit or 15 degrees Celsius. A denser humidity can make the temperature feel a lot warmer because the body can produce less sweat. When conditions become extreme allow yourself to refrain from training. Your conditions won’t disappear all of the sudden and the risk can get to high. Consider a bike ride instead of running when it’s too hot. For runners its recommend riding at around 100 rpm. Also read: Calculate loss of fluids.